To learn more about the Michigan Poor People's Campaign, please read this terrific article on the first-hand experience of a participant journalist, Dawn R. Wolfe. Yesterday, I personally witnessed a 400-plus-strong gathering of activists as they burst into a mighty, confidence-filled crowd ready to take on the forces that are endangering poor people in the city of Detroit. From Central United Methodist Church to the Detroit Water and Sewerage Department, and then on to Campus Martius and blocking the QLine at Woodward and Michigan Ave., poor people — and their allies throughout the state — put those in power on notice. 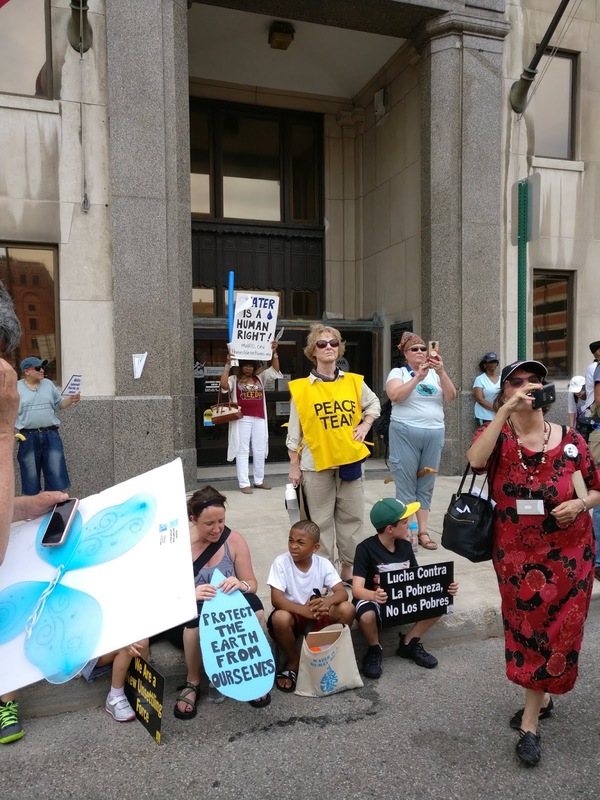 Before setting off to take action in the streets, the Michigan Poor People’s Campaign (PPC) first came together at Central United Methodist Church for what had become the traditional pre-action rally. Monday’s speakers included the Rev. Dr. Jill Hardt Zundel, Central United’s senior pastor, and the Michigan Welfare Rights Organization’s (MWRO) State Chair, Maureen Taylor. But Monday’s pre-action rally also had something different — a memorial service for Gordon Leon King, a formerly homeless person who had been receiving support from the Central United community. While the rally’s speeches and protest songs helped cut through the sticky heat, there is nothing like mourning a human being’s death by state-sanctioned poverty to illustrate just why the Michigan Poor People’s Campaign has been taking to the streets.